The last two weeks were all about basketball. My school team won in the Board Semi-Finals and then lost in the Board Finals. It was our first loss of the whole season so we were still pleased with our success. 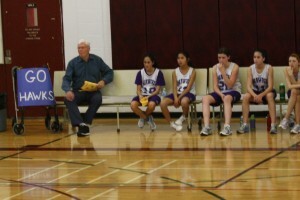 My Grandpa was asked to sit on the players bench for the last game since he was at all the games and even the practices. He’s like our number #1 fan. His blue poster goes everywhere with him. Last Friday my dad and I went to Oshawa for a soccer tournament and we didn’t get home until Sunday night. It was a lot of fun even if it was freezing cold and really wet.!!! I felt bad about being away since it was Mother’s Day weekend and all my Cousins, Aunts and Uncles were in town so I didn’t get to see them very much. Tryouts for school soccer team also started last week so I’ve had soccer before school two days a week as well as the club practices two nights a week. 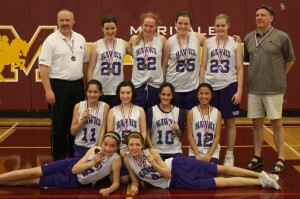 I was invited along with 45 other girls from all the Public Schools in Ottawa to try out for an All Star Basketball Team. We had two nights of tryouts with the assistant coach from Ottawa U. I was very excited to make the team. Basically it means that we only have one practice together next Tuesday and then we have a televised game on Thursday against the All Star Team from the Catholic School Board. It’s only for one game but it’s a great experience. I find it very weird that for once I’m not the tallest girl 🙂 I’ve never seen so many tall girls my age before! So after all the basketball practices, school soccer and club soccer practices I head out to Blackburn for TKD and don’t get home until around 10:30 p.m. Mr. LeGrow has been very understanding with my time limits so when I’m there I just work on my patterns and strengthening at the back of the class to get ready for CanAm’s three weeks. He knows I’m getting enough cardio with my other activities. I just found out that they will be selecting the National Sparring Team and the Pattern Team at the CanAm’s so I’m really working hard. The Individual events won’t be selected until November in Vancouver at the National Championships but if I can at least get on the Team Events it will hopefully be easier to get sponsors and funding. I’ll have a lot of exciting news to report next week after the All Star Game and then a two day Seminar with Master Lan. He is the TKD National Coach from Germany and he is giving a sparring workshop. I can’t wait to get some extra coaching. He has a great track record of producing champions. Your Grampa is your #1 fan. I love hearing that your Grampa was cheering from the bench. You have a lot of fans!